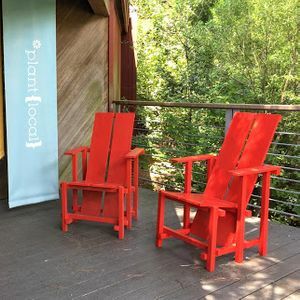 Saturday, July 20, 2019 10 a.m.–1 p.m.
Chanticleer Garden horticulturist and craftsman Dan Benarcik returns to the Arboretum to lead a workshop in constructing the iconic and timeless Wave Hill chair. Based on a 1918 design by acclaimed Dutch architect Gerrit Rietveld and modified in the 1960s, the chair was popularized in the garden at Wave Hill in the Bronx. This chair is suitable for any garden setting. Bring a fully charged cordless drill; all materials are provided. Constructed chairs retail for $325.